Other utilities have demand charges, but they are optional. Two public utilities, Salt River Project and Lakeland Electric in Florida, and one electric cooperative, Intermountain Rural Electric Association in Colorado, implemented demand charges last year. But to date no legislature or public service commission has approved a mandatory demand charge on residential customers. ComEd, in fact, already has company. Oklahoma Gas & Electric recently proposed a mandatory residential demand charge in a rate case before the Oklahoma Corporation Commission, following a number of similar utility proposals in the West. “Demand charges have become one of the hot issues in the past 18 to 20 months,” Hledik said. In their fourth quarter 2015 “50 States of Solar” report, the North Carolina Clean Energy Technology Center and Meister Consultants Group found that 13 utilities had proposed a demand charge on solar customers. ComEd's demand charge proposal was not included in the report, as it was proposed in Q1 2016. Demand charges have also become lightning rods of controversy, attracting criticism from consumer advocates and solar power advocates, who say utilities use them to slow the growth of distributed energy resources, particularly rooftop solar. One of the primary drivers of distributed solar growth has been the prospect that a homeowner can reduce their electric bill by reducing energy drawn from the grid. Demand charges could circumvent that mechanism, allowing utilities to draw more revenue from customers who generate a portion of their own electricity. A demand charge is based on a customer’s peak usage during a billing cycle and is designed to cover the cost of having those resources at the ready during times of high demand. So while homeowners with solar panels could use less energy, they could end up paying more for their utility service depending on their peak usage. Most of the electricity sold to residential customers in the United States is paid for on a volumetric basis; customers pay for the electricity they use measured in kilowatt hours. Utilities also include a fixed charge in their bills that doesn’t vary month to month, but those charges tend to be small. Demand charges are common for commercial and industrial customers, but to date have not been widely used in the residential sector. Demand charges are like a “sneaky fixed charge,” says Sean Gallagher, vice president of state affairs at the Solar Energy Industries Association (SEIA), a trade group for U.S. solar installers. Fixed charges can’t be avoided. Likewise, many customers would have a hard time knowing when their usage peaks, Gallagher said, and they could end up incurring high demand charges. Solar advocates say that if they are high enough, fixed charges and demand charges have the potential to undermine the economics of rooftop solar by stretching out the payback period. Arizona has become the epicenter of these battles in recent years. Salt River Project was the first to adopt a demand charge, but the investor-owned utilities have shown interest as well. UNS Energy is in the midst of a rate caseinvolving mandatory demand charges that could set a precedent in the state where Tucson Electric Power has an open rate case and Arizona Public Service has been exploring similar proposals. SolarCity, the nation's largest rooftop solar installer, is opposing the demand charge push in the state. It says Salt River Project’s demand charges have caused new rooftop applications to fall by about 95% in its service area. GTM Research estimates a slightly less severe decline of 75%. Hledik says his research found a surprising number of utilities — 20 so far — that already offer residential demand charges as an option. They include Alabama Power, Alaska Electric Light & Power, Arizona Public Service, Black Hills, Dominion, Duke Energy, Georgia Power, Los Angeles Department of Water and Power, and Xcel Energy. But for the most part, customer participation rates have been low, often below 1%. Hledik says the influx of distributed resources is just one of the factors prompting utilities to revisit their rate designs. Another factor is technological. Until recently most homes did not have meters capable of measuring peak demand. With the proliferation of smart meters, that is changing, making the implementation of demand charges more feasible. Another driving factor is the slowdown in load growth that is facing the power industry as a whole. And, even as people use less electricity, the cost of maintaining grid reliability is rising. That combination of declining sales and rising costs could prompt utilities to raise rates, and there are concerns that higher rates could disproportionately affect lower income customers least able to mitigate higher rates by investing in more efficient appliances or solar panels. That, in turn, could prompt regulators to disallow investments for grid upgrades. In this environment, Hledik says, utilities are “rediscovering” demand charges as a way of better aligning rate structure with costs. In many cases such rate redesigns are revenue neutral. The utility would collect the same amount of revenue, but some customers would pay more and some would pay less. In that respect, Hledik says rates would be more “equitable” because they would better reflect the usage of customers who incur the most costs for utilities. 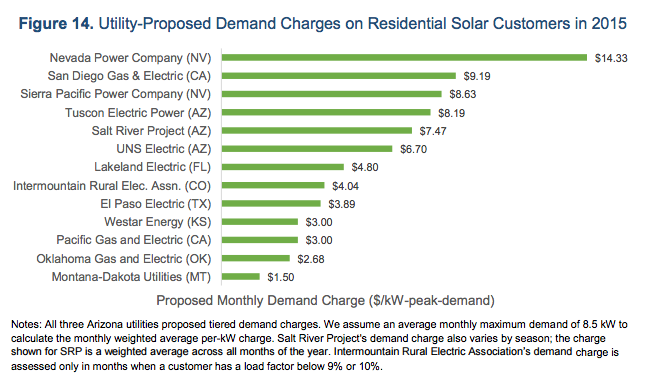 To date, the push for mandatory demand charges has largely focused on the Southwest — states like Arizona and Nevada with strong solar potential and high rooftop PV penetration. In Chicago, a city with fewer than 500 rooftop solar installations, ComEd officials focused on the fairness argument in announcing their new rate proposal, saying the demand charge would make the utility’s rates more “equitable” across all customer classes. Consumer advocates in the state are still skeptical. Critics such as Madigan say utilities have other tools they should deploy before turning to demand charges, tools such as decoupling and caps on net metering incentives. SEIA's Gallagher argues that time-of-use rates would provide a utility with a better reflection of its costs and allow customers greater control over how much they pay for electricity. ComEd has operated an optional real-time pricing program for smart meter customers for more than a decade, but fewer than 11,000 consumers have signed on. The new bill would not make it mandatory for all, but does include another noteworthy detail for the solar sector — a 50% reduction in monthly fixed charges. In recent years a number of utilities have pushed higher fixed charges as a response to stagnant load growth and DER proliferation. But after persistent pushback from consumer and clean energy advocates, many in the sector appear to be looking to demand charges as a fairer, more precise tool than a single, blanket charge. Such proposals were hot topics at meetings state utility regulators both last year and this winter. ​But utilities looking to shore up revenue streams with demand charges should be careful, analysts say. While they can help companies recoup grid costs in the short term, demand charges could have the unintended consequence of promoting the installation of more distributed storage, since the customer-sited batteries could allow users to cut their peak usage. This practice, increasingly common among commercial and industrial ratepayers, could lead to more load defection over time as battery and solar prices continue to decline. For ComEd, enhancing the incentive for consumer-sited DERs is likely part of the strategy. In an interview this March, CEO Anne Pramaggiore said the new proposals are a part of her utility's transition to a platform model — one where the grid acts as a facilitator for numerous distributed resources. But in Chicago, a service area with large low-income populations, ensuring equity in the rate structure is critical, Pramaggiore added. Going forward, the debates with renewables and consumer advocates will likely focus on that fairness argument and how to ensure distributed resources are properly valued and compensated on the system.